Several people have been injured in a shooting on a tram in the central Dutch city of Utrecht, police say. 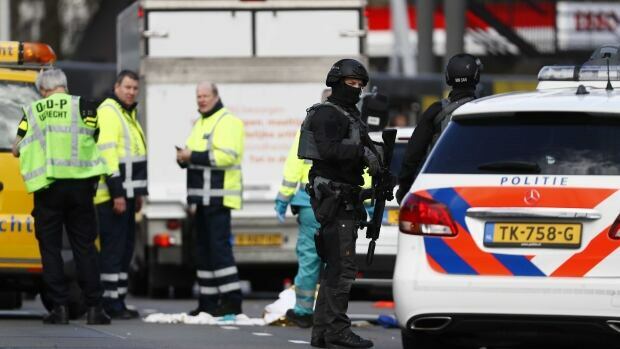 The daily Algemeen Dagblad newspaper reports an anti-terrorism unit had been sent to the scene, and Dutch police say they are considering the possibility there was a “terrorist motive” for the shooting around 10:45 a.m. local time. Utrecht police said a square at a tram station in a residential neighbourhood outside the city centre has been cordoned off and emergency services are at the scene. Helicopters were sent to the scene to airlift victims and police were appealing to the public to stay away to allow first responders to do their work. Dutch media reports, citing police, say the suspected shooter is still at large. Those reports also say police have instructed schools to keep their doors closed.